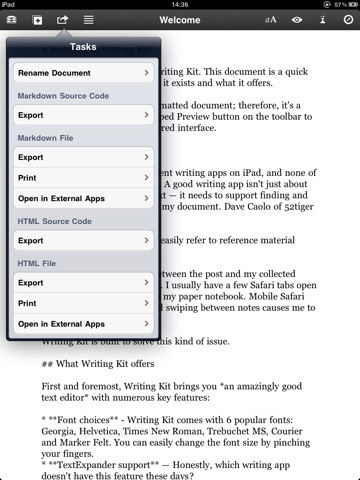 Writing Kit is one of the most complete text editing solutions for the iPad I have seen in the App Store. There’s an old axiom that writers write, but sometimes I think writers browse, dawdle, aimlessly stare out the window and then write a little before getting back to the main job of dawdling. It’s easy to get distracted when writing which is wh.. SQUIRREL! But seriously, focus is important when writing, which is why in many ways the iPad is an excellent tool for text-based creatives. Even with multi-tasking, you are still limited to just seeing your word on the page when you are writing it, which is excellent for focus. Whilst Apple supplies a Notes app with the iPad and sells a word processor – Pages, there is a market for feature packed (and feature stripped) text editors in the App Store. If you’ve had a writing problem on the iPad, chances are Writing Kit will try and solve it for you. One of the more tired cliches wheeled out at the launch of the original iPad (and there were many) was that it was useless for productivity – that Apple had created a shiny toy for mindless content consumers but to do any “serious” work you would be much better off with a netbook (remember netbooks!). Of course this is nonsense (I’m writing this on an iPad, using the very app I am reviewing) but Writing Kit does address several issues that writing on the iPad tends to bring up. First and foremost, whilst I love the single-minded focus the iPad writing experience brings, from time to time it is nice to be able to look things up. Writing Kit has a built in web-browser that enables you to access a host of references or resources for when you get stuck on a fact or a phrase. Even better is the Quick Research button that uses the DuckDuckGo (who?) search engine service to pull quick queries from the web – who wrote Breakfast of Champions? What does inchoate mean? What’s the Capital of Mauritius? – that sort of thing, which is fantastic for writing with an uninterrupted flow as it keeps your mind “in the document”. Tap-and-hold any content on the page and simply choose Insert into Editor; Writing Kit will offer you to insert it into your document as either a link, an image or a quote. Typing on a Bluetooth Keyboard is the best way to edit text on the iPad but if you’re stuck with the onscreen keyboard, Writing Kit adds a row on top that provides access to MarkDown tools, making formatting your document with headers, bold text, italics, lists and links much easier. You can quickly move your cursor or select any text for editing just by tapping on the left or right margin of the text with one or two fingers. Use one finger to move back and forth character by character, two fingers to do so word by word. It isn’t quite as good as the additional row featured in IA Writer (my other favourite writing app) but if you are writing for the web or something else where you will be using a lot of MarkDown then it’s a winner. 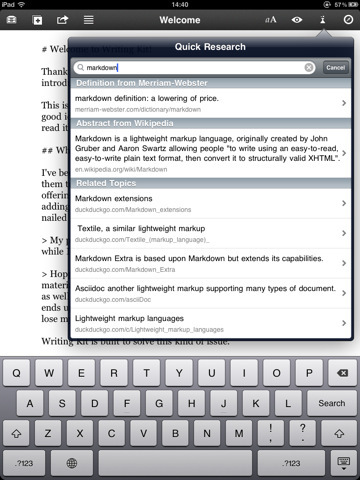 There’s even a handy built in MarkDown preview button. It goes without saying that Writing Kit syncs with DropBox (who Apple should really buy so we can see Siri-like integration across all apps) and all your documents are automatically saved every 10 keystrokes, making worries about data loss a thing of the bad old days. Writing Kit also supports TextExpander (handy if you say the same thing over and over again). Love writing? Love your iPad? Chances are high you’ll love Writing Kit. AppSafari review of Writing Kit was written by Shem Pennant on October 13th, 2011 and categorized under App Store, iPad apps, Productivity, Universal, Utilities. Page viewed 5297 times, 1 so far today. Need help on using these apps? Please read the Help Page.